Gimme practice green marker features a fiberglass stick 1/2” thick and a cast aluminum head. The head is designed with a smooth surface to look good painted or with an optional custom decal (sold separately). Heads available in white, red, and green. Also available numbered 1-9 or 10-18. ​Red powder coated cast aluminum round head. 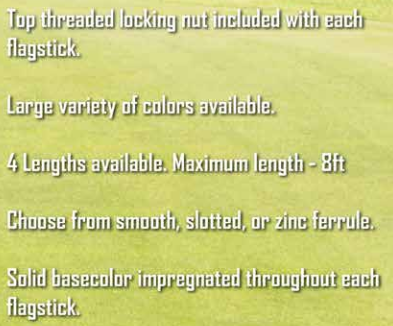 Rod available in 23-3/4"​ aluminum or 32” white or yellow fiberglass. Bases available in plastic or bronze. Numbered heads also available.